To make my bookcase look a little more authentic for the upcoming season, I wanted to create an illusion of having some witch or wizard themed books instead of the regular ones on gardening and nature. You can get printable book covers but I only needed something to quickly cover the spines of a selection of books which are out on show. 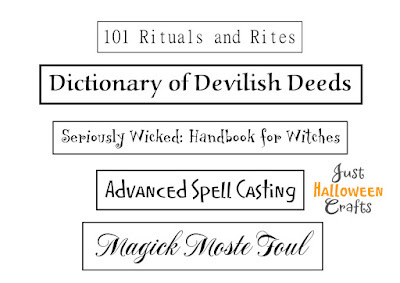 Included are some free, printable Halloween book spines for you to use for your own decorations this Fall season. 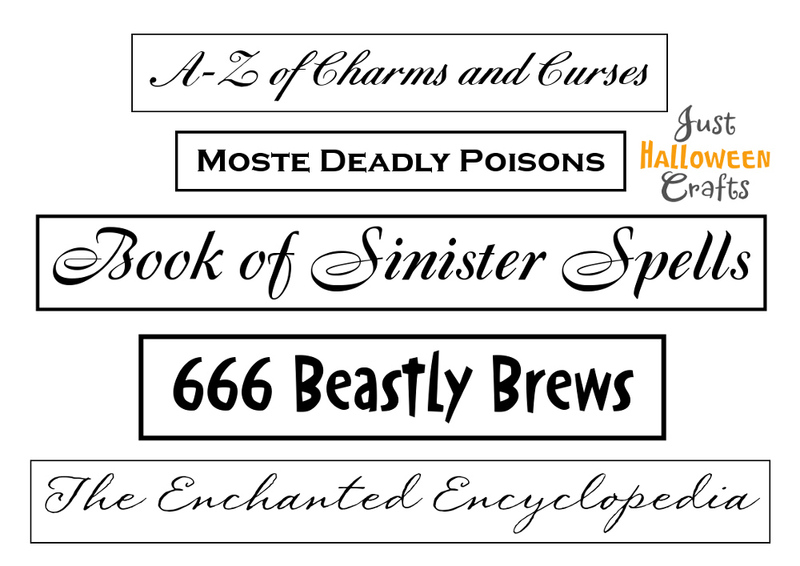 I came up with a set of 10 fun themed titles which you can print off and use for your own decorations. This post contains the freebies for printing as well as a quick how to on getting the look. First print out the free pages. In most cases, you'll probably want to print them in portrait or tall mode which sizes them a bit smaller to suit most regular books. If you have some really large books then try printing them on landscape orientation or wide which makes the "labels" a lot larger. Your print options normally give you ways of reducing or enlarging the print size in addition to these options. 🎃 You don't need to cover all your books. 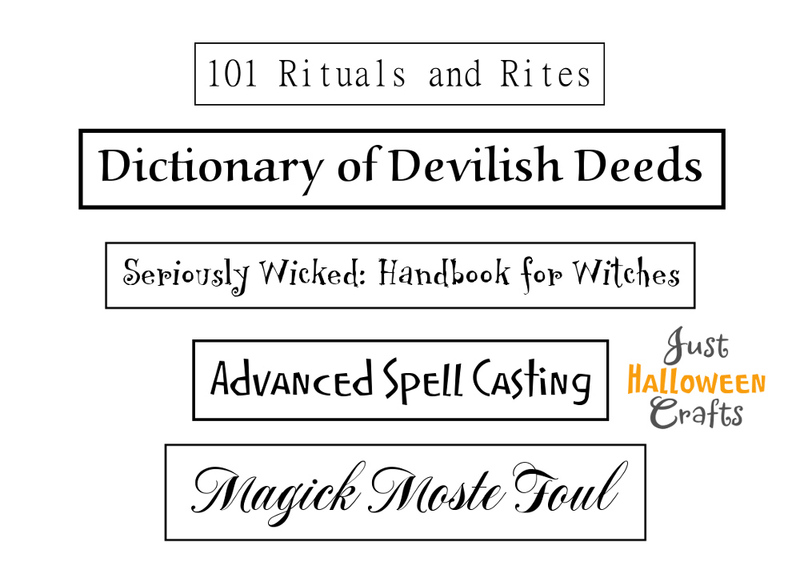 I picked out 10 hard cover books which I wanted to change up for the Halloween season. I left my fantasy collection of books as they were since they already fit quite well with the whole look. Other books have been covered over with dark netting fabrics just so they blend into the background and are not so noticeable. There are lots of tricks you can employ to cover up items you don't want on show, including placing objects like candles and potion bottles and jars in front of them. You need a roll of paper to quickly cut and wrap around your chosen books. I went with plain brown paper for a very simple, clean and uniform look. Plain black would work well or you could choose a range of patterned papers. Whatever look you go for, a large roll of paper works best and will wrap books both large and small. To wrap, I measured the height of each book with a ruler then marked out this measurement across the roll of paper and cut. Once cut to size, I wrapped it around the book just like a regular dust jacket and secured on the inside with some low tack masking tape to keep it in place. Cut out a suitably sized label, apply adhesive to the back with a simple glue pen or glue stick and place down the spine. If you want a different look, you could print these spine labels onto colored card or paper instead of plain white. There are lots of ways in which you can change this up to give different looks depending how much time and effort you have to put in. I like how quick this was to do and how effective it looks for a group of books on the shelf. I'll be starting to place decorative elements in front of them now we are starting to decorate for Halloween. I hope you've enjoyed reading my justhalloweencrafts page today, thanks for your visit. Let me know if you make these. Don't forget your free printables below. 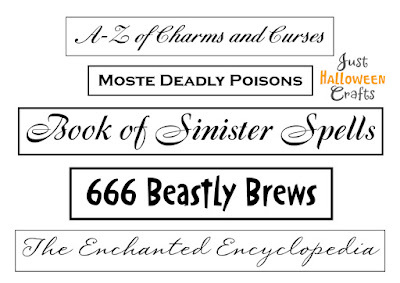 This free Halloween book spines printable is for your personal use only. You are welcome to blog about how you've used this freebie along with your own photos providing that you include a link back to this page.